← Help, I forgot to ac-cen-tu-ate the positive! I was running along, on a beautiful crisp early autumn morning, heading for my expected slow but acceptable-to-me time, when I unexpectedly tripped going down a curb at about 7 km. It’s pretty well impossible to stop a fall when you trip when you’re running, and I confirmed that expectation. Down I went, mostly on the side of my face. The nice man who was right there, stopping traffic so the runners could cross the street, picked me up, checked me for dizziness, wrapped me in a space blanket to keep me warm, and called the race medic to come treat my bleeding face. I assumed this was the end of the race for me and, needless to say, didn’t give my Garmin a thought. 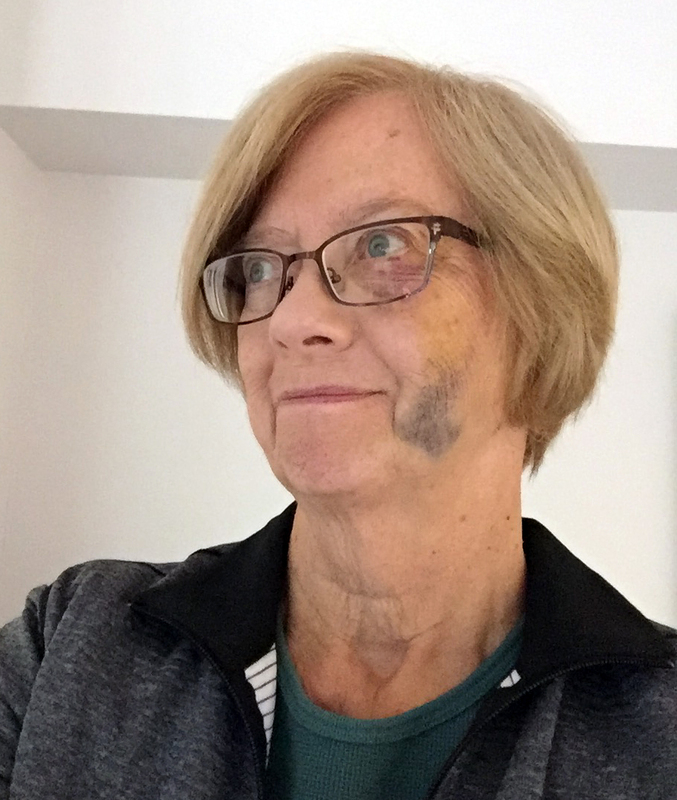 However – and here’s the rub – the medic was on a bike, not in a car that could have taken me to the finish line, and once I was repaired and all checked out, he asked if I could walk it back. I could – in fact I ran it back the final 3 kms. The race wasn’t over after all! But, of course, I had lost LOTS of time while I was being attended to. Lots and lots of time. And the worst of it was, I didn’t know how much time. So when I neared the finish line, I was at great pains to explain why I had taken so long. As if anyone cared but me! My left cheek has an incipient goose egg on it, but it’s hardly noticeable … yet. My brother had a great run, with a better result than he had hoped for (by our standards). I finished. I may well have done as well as I had hoped for, and no-one will ever know otherwise! I could have been hurt a lot more seriously; as it is I’ll mostly just look bad for a while. Wait ’til it turns purple and yellow! Moral of the story: If you trip and fall while running, call out as you’re going down, “pause my Garmin”! 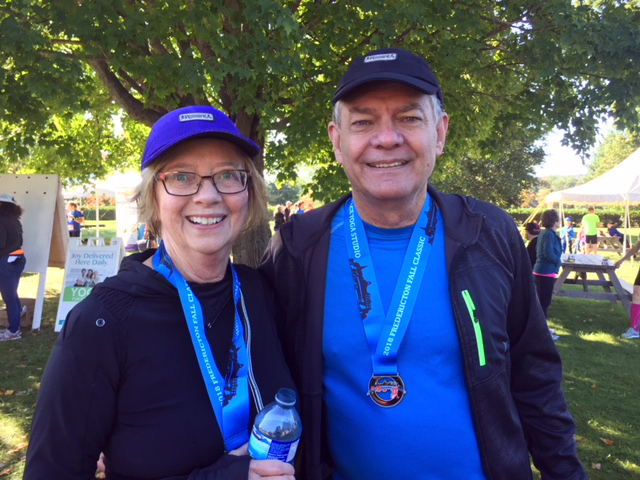 This entry was posted in Life stories, Running and tagged advice for runners, falling, Garmin, humor, older runners, runners' sayings, running, tripping. Bookmark the permalink. Ouch! No, I won’t say stop running, no, no, no, but I will say ouch. And, I learned something: Airway, breathing, circulation and PAUSE the Garmin! Hope you have healed well. I’m glad to know you’re feeling better. Takes a lifetime to get that feet out of the way thing happening when you want it. Just think, though, you were r-u-n-n-i-n-g when it happened and that’s just cool. — not the experience of the fall but the commitment and pursuit. Ouch. Well done you Jane on finishing the race and making light of what must have been a bad moment. I’ve yet to fall in a race but I regularly take a dive on the cliff paths or trails. It comes with age and, in my case, not picking my feet up properly. Fortunately no serious damage to date. Yikes. You’re reinforcing my underlying concern that it really is about aging and foot dragging. I’m not all that big on continuing to take dives. But … to give up a nice leisurely jog on a beautiful day … tough call! What an unlucky event, but you are a true trouper and still finish the race. Finishing under theses circumstances is more important then your time. Better luck on your next race. Thanks, Eloi. That’s my take-away, too. Runners are runners, both fast and slow! 🙂 Hope all’s well with your running plans and dreams. I chuckled when you initially called it your “Fall Classic” run. That set you up for the fall, I guess 😟. I hope you’re back to your normal and enjoying your runs again. Lol. I hadn’t thought of that word play. This isn’t going to bode well for me at next year’s Fall Classic when I think of this connection! Thanks for the well wishes, Francine. Keep it up! Glad you’re OK! Wow! You are like a superhero. The fact that you are running is amazing and that you kept going after a fall like that. Holy cow! I am very impressed! 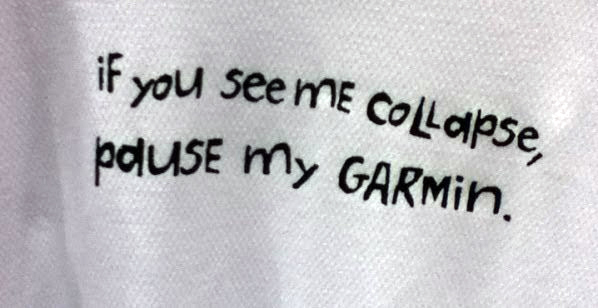 I do have to ask you,… what is a garmin??? I have no idea?? But way to go, girl! Keep running. If it makes you feel better about falling, a couple years ago I had a crazy fall. I was pumping gas and the pump actually broke and burst, spilling gasoline all over me. I tried to pull out the pump to stop the shower of raining gas and slipped and fell. I literally did a full on split and couldn’t move. It turned out that my hamstring ripped right off the bone taking part of the bone with it and three of my lower vertebrae were damaged. The gasoline was so slick that I went down full force hitting the ground with a resounding boom. So, I was not able to move. Thankfully, some lovely people called 911 and carried me inside the gas station to wait while I called my oldest son. He arrived when the ambulance did and came with me to the hospital. When I got to the hospital the nurses and doctors came running and stripping off my clothing. I did not even think about the fact that I was covered head to toe in gasoline and could have burst into flames. Anyhow, to make a long story short. I was in a wheel chair for about three and half months and couldn’t stand because I couldn’t unbend my leg. It was a crazy injury. I used a walker for several months and it took time to be able to drive again. I was incapacitated for at least half a year. I did recover, but haven’t been quite the same. I can’t walk as far as I used to and forget about running. Oh, and for a while I had a PTSD experience when I went to try and pump gas again. My son had to come and do it for me. I’m okay now, but boy oh boy was that a crazy fall… I take the stairs in my condo building to try to build up my strength and endurance.. The doctors thought it was just my back at first and by the time insurance approved an MRI when they realized it was my hamstring there was nothing they could do. So it just took time to heal. It never goes back and I teeter a bit when I walk now. And forget about wearing heels. (That’s a bummer, I loved wearing heels.) So talk about falls??? Yikes. Truthfully, I just feel so grateful to be up and walking around again. After spending months in bed or in a wheel chair, every day when I wake up I say a big thank you and I do a little dance. It is absolutely wonderful to be able to not be confined any more. So run like the wind or slow as you want. Just run as long as you can. You got this!! Oh my God, Lesley, that is unbelievably awful. And you were just pumping gas, not even doing something questionable like running when perhaps you are fooling yourself that you’re still young enough to do so. Wow. Shows how approaching everything with some degree of caution is warranted. It will take me a while to get my head around such a terrible injury coming from innocently pumping gas. I will never run like the wind, but I can pretend! For now, at least. To find out what a Garmin is, check out an old post of mine, Ode to my Garmin (https://robbyrobinsjourney.wordpress.com/?s=ode+to+my+garmin). I’ve added a link to it into this post for non-runners, thanks to your comment. Take care of yourself, Lesley. Oh, I’m fine Jane! The irony of my accident story is that I went to get gas right AFTER power walking at the largest mall in the area. I remember feeling exhilarated after walking so far! I am envious of your skills and stamina that’s for sure! We have to take life as it comes and now I laugh at how I got hurt. I usually just say accident. Since who would believe it all happened from pumping gas! Crazy, right? But it sure made me grateful for technology. Being stuck in bed, immobile I wrote an entire poetry curriculum for the county and it was picked up and used by the office of diversity, so as long as I was being creative with my mind I was happy. AND I discovered Netflix. So I became a huge Doctor Who fan! There are always perks to every situation! Thanks for enlightening me on what a garmin is! Well, I could say “why don’t you stop running” but the fact is, we can trip and fall in all kind of circumstances (specially when we reach a certain age) so why not when you are doing what you like! I just hope your face gets back to normal soon .. pretty and determined lady!